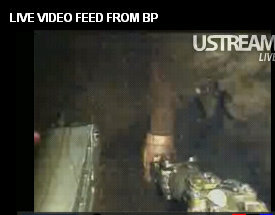 Up to today, the BP live oil spill feed was showing a calm picture without any gushing oil and only equipment. Today, however, that has changed and we now get a clearer picture of the massive oil gushing from the BP oil pipe 5000 feet below the ocean surface. This new live video feed from BP is not only showing the world once again the severity of the gushing oil from the pipe, but the video is now showing something we haven’t seen before. The oil, in some shots, is showing the gushing oil being channeled through pipes as it appears that BP is preparing to funnel this gushing oil onto barges. These new video images are somewhat encouraging even in the midst of the discouraging amount of oil being gushed into the gulf. If BP can continue on successfully with their seal placement on the pipe, and then channel the rest of the gushing oil through pipes onto barges, then the damage will be substantially mitigated. BP should be liquidated/nationalized by the government…this is an obscenity. This is just bloody god awful. Nothing can ever make this right. No ,Bp should be shut down completely.Simple fix is take your car somewhere else to get fuel.Government does not need to be at the helm .Nice try though lib. The Russians could have sealed this in 48 hours. They've done it a hundred times. They plant a small nuclear device, set it off and it closes the whole well off. Why are we wasting so much time with BP continually screwing the pooch? BP doesn't want this because they eventually want to salvage this well and make money. Damn straight MF , there is no excuse or is it to late to detonate ? Will it turn the planet into a funny car ? Only in Americas !! The idea of "shutting down" or "liquidating" BP is almost so retarded, I came close to not wasting the time to respond here. Since I could not let this moronic feeding frenzy continue, let me state this; although this is a horrible, horrible incident that will no doubt, take years to correct, the facts are all not in. BP, though definitely responsible, is not necessarily the main culprit here and without question, not the sole guilty party. They are, as with all our culture embraces here in the states, the easiest one to blame. Blame should be laid at the feet of all until the investigation is complete and the facts are laid out for all to see. I suspect, this administration, that so many of my leftist brothers elected bares some responsibility for this disaster and the complete lack of urgency in taking control of situation. I am also confident that Trans ocean, Halliburton and many more will be found just as guilty, if not more than BP. The only question now is, how can we somehow find a way to blame the last administration for this??? This thing just mushroomed out. The pressure must be intense at this point after releasing 30,000ft of pressure in a 20 inch pipe – full open. I would say another blow out is about to occur and the psi increases substantially. The camera was pretty still in all earlier pics and now it waves back and forth from the force of the flow through water shockwave down there at 5,000ft below sea level. Now Pa' shot a hole in the ground and up from below came a bubbling crude. Oil, that is, black gold! Detonate the hole and make BP pay for there mess ! Mix it with garbage island and make a statue of democracy ! New gob's and job's everywhere . I disagree that the other two parties will be found out fault. From everything I've heard and read it will be a classic case of BP company man, with someone higher up making a decision to not perform all of the tests, and taking a shortcut to save $$. They took a risk and killed people and people's livellyhood, and destroyed the eco system in south louisiana. Those that are responsible should never again see freedom. Reports now in that the blowout preventer was a 500-700psi max. It was a shallow well preventer. They should have used a 4,000-5,000psi deep well blowout preventer. The initial blowout on the rig was at 3,750psi Right now at the well head the psi is minimum 3,,750 to over 5,000psi. Crimpiing the pipe and bending it was a better solution. This thing is now full open and unstoppable. Oil rains will kill East USA greenery, gas on grass. thats what you get when you invite foreigners into our country (OBAMA/ARIZONA) these people dont take care of things like they would if it ere theirs, example: lending your neighbor a mower, chances are he wont clean it up after its used, thank you BP for all (or lack there of) that you do!